Compass Fitouts has completed hundreds of high quality projects for a wide range of clients, from leading National Retail Chains to one-off tenancy fitouts. Our reputation for consistently delivering superior results is best displayed by the high level of repeat and referral work we undertake. We pride ourselves on the many strong, long-term relationships we have developed. The business is owned and managed by Frazer Watson and Andrew Farrington. Their experience gained from Senior Management roles in major corporations brings to the company an invaluable understanding of the Branding, Operational and Communication requirements of Major Retail Groups. Frazer and Andrew's hands-on approach means personal contact occurs to ensure projects run smoothly to each client's complete satisfaction. The Compass Team is made up of experienced professionals who are specialists in their respective fields. 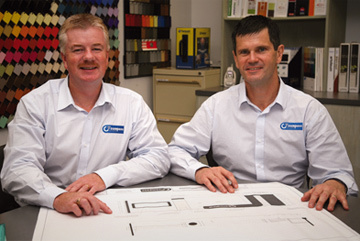 They take great pride in their work and understand the importance of minimal impact on your business during the fitout process.